The adjuvanted zoster vaccine recombinant, Shingrix, was approved for adults 50 years and older for the prevention of herpes zoster (shingles) in October 2017.1 Shingles, which develops after the reactivation of the varicella-zoster virus (VZV), is a painful rash that generally occurs on 1 side of the body, usually the face or torso. Complications may include postherpetic neuralgia (PHN), ophthalmic involvement, and bacterial infection. These complications can lead to hospitalization or even death. The risk of shingles and PHN increases with age, and about 1 of every 3 individuals in the United States will develop shingles, leading to about 1 million cases each year. Shingrix has been shown to boost VZV-specific immune response with the adjuvant known as ASO1B, which is thought to protect against shingles.2 Additionally, VZV glycoprotein E is essential for viral replication and cell-to-cell spread and is the primary target of VZV-specific immune responses. Shingrix does not contain preservatives. Immunosuppressive therapies may reduce the effectiveness of Shingrix. The vaccine is contraindicated in patients with a history of a severe allergic reaction to any vaccine component or after a previous dose of Shingrix. Health care providers should review patients’ immunization history for possible sensitivity and previous vaccination-related adverse reactions. Epinephrine should be administered in the event of an anaphylactic reaction. 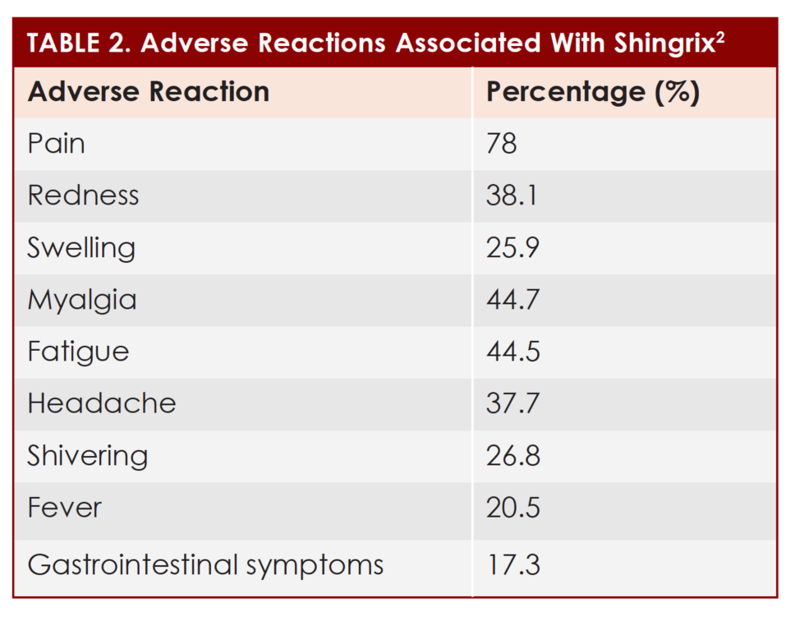 Clinical studies have demonstrated that Shingrix is safe, with the most common adverse effects being mild to moderate in severity (See Table 2).2 Adverse reactions should be reported to the Vaccine Adverse Events Reporting System of the US Centers for Disease Control and Prevention (CDC). There are no available human data to establish any risks associated with administering Shingrix to pregnant women, and it is unknown whether it is excreted into human milk. The safety and efficacy of Shingrix have not been evaluated in patients younger than 18 years of age. During clinical studies, patients could receive the inactivated influenza vaccine up to 8 days before each Shingrix dose or at least 14 days after the vaccine.4,5 The influenza vaccine did not affect the immune response. The influenza vaccine can be administered on the same day as Shingrix as separate injections. Study participants received 2 IM doses of Shingrix or placebo 2 months apart. The primary objective was to evaluate the efficacy of the vaccine compared with placebo in reducing the risk of herpes zoster in older adults. Secondary endpoints included assessing the vaccine efficacy in each age group (50 to 59 years, 60 to 69 years, and at least 70 years). The Advisory Committee on Immunization Practices (ACIP) voted that Shingrix is recommended as the preferred vaccine for healthy adults 50 years and older to prevent shingles and related complications.3 This is a change from the previous recommendations that individuals 60 years and older receive the Zostavax vaccine and will likely result in more patients being vaccinated. Evidence indicates that an individual’s risk of developing shingles increases after 50 years of age. Patients who have previously received the Zostavax vaccine should still receive 2 doses of Shingrix.3 It is important to note that Shingrix is not indicated for chicken pox prevention. Because Shingrix is not a live vaccine like Zostavax, issues should not be expected with administering it to patients who may be immunocompromised. However, the studies excluded patients with confirmed or suspected immunosuppressive conditions (eg, cancer or HIV infection) or immunosuppressive therapy (eg, chemotherapy, organ transplantation medications, or autoimmune disorder treatment).4,5 Data regarding administration of Shingrix to immunocompromised patients are being gathered and should be published by the ACIP.3 Individuals who are immunocompromised with the following conditions have an increased risk of developing shingles: cancer, HIV, bone marrow or solid organ transplantation, or taking immunosuppressive medications. The ACIP recommends that Shingrix can be administered to patients taking low-dose immunosuppressive therapy (eg, less than 20 mg / day of prednisone or equivalent or using inhaled or topical steroids) and individuals anticipating immunosuppression or those who have recovered from an immunocompromising condition.3 Patients with chronic medical conditions should receive Shingrix. Health care providers can play an important role in educating patients about the importance of completing the vaccine series. There is little information available regarding the efficacy of just 1 dose of Shingrix. Compliance may be increased by follow-up reminder phone calls and counseling during refill pickups, in the case of pharmacists who administer the vaccine. Patients may inquire about whether they can develop shingles from Shingrix. 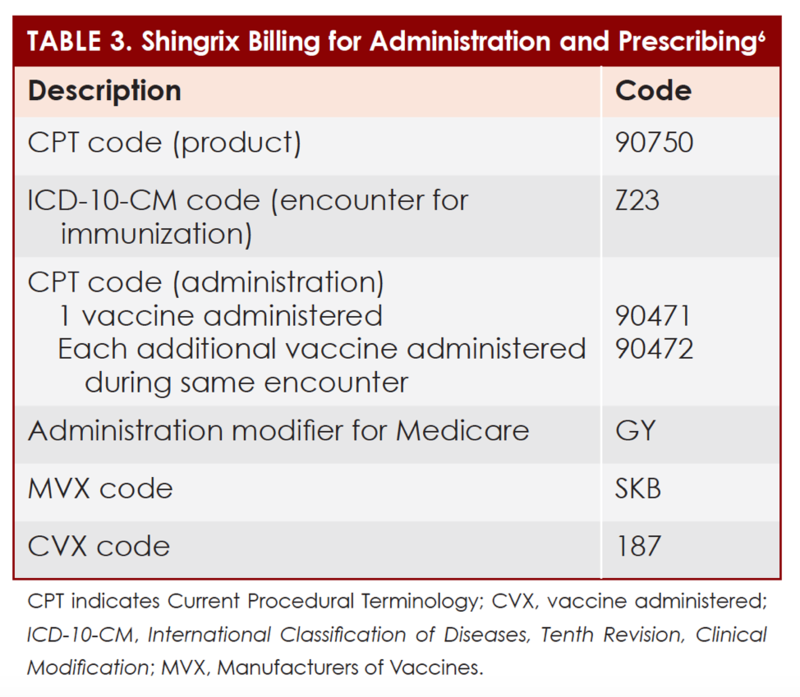 Health care providers should explain that because Shingrix is not a live vaccine, individuals cannot develop shingles from the vaccine. It is also important to educate patients who have experienced shingles to still receive the vaccine to prevent future recurrences. Two to 3 repeat shingles episodes can occur in someone’s lifetime.1 Patients should generally wait until the shingles rash has disappeared before being vaccinated with Shingrix. Health care providers should discuss with patients how Shingrix can help prevent PHN, which is the most common complication of shingles.10 Individuals are at a greater risk of experiencing PHN if they are over 50 years of age, have a severe case of shingles, or have a chronic disease such as diabetes. An earlier version of this article was previously published as an Immunization Special Report in Pharmacy Times®. Jennifer Gershman, PharmD, CPh, is a medical writer and a Pharmacy Times® contributor who resides in South Florida. 1. Shingles (herpes zoster). CDC website. cdc.gov/shingles/. Updated January 30, 2018. Accessed January 10, 2018. 2. Shingrix [prescribing information]. Research Triangle Park, NC: GlaxoSmithKline; 2017. 3. Dooling KL, Guo A, Patel M, et al. Recommendations of the Advisory Committee on immunization practices for use of herpes zoster vaccines. MMWR Morb Mortal Wkly Rep. 2018;67(3):103-108. doi: 10.15585/mmwr.mm6703a5. 4. Lal H, Cunningham AL, Godeaux O, et al; ZOE-50 Study Group. Efficacy of an adjuvanted herpes zoster subunit vaccine in older adults. N Engl J Med. 2015;372(22):2087-2096. doi: 10.1056/NEJMoa1501184. 5. Cunningham AL, LaI H, Chlibek MK, et al; ZOE-50 Study Group. Efficacy of the herpes zoster subunit vaccine in adults 70 years of age or older. N Engl J Med. 2016;375(11):1019-1032. doi: 10.1056/NEJMoa1603800. 6. The new shingles vaccine: what you should know about Shingrix. Consum Rep. consumerreports.org/shingles-vaccine/new-shingles-vaccine-shingrix-what-you-should-know/. Updated January 25, 2018. Accessed January 11, 2018. 7. Shingrix coding. GlaxoSmithKline website. gsksource.com/pharma/content/gsk/source/us/en/brands/shingrix/pi/coding.html. Accessed January 25, 2018. 8. Grupping K, Campora L, Douha M, et al. Immunogenicity and safety of the HZ/su adjuvanted herpes zoster subunit vaccine in adults previously vaccinated with a live attenuated herpes zoster vaccine. J Infect Dis. 2017;216(11):1343-1351. doi: 10.1093/infdis/jix482. 9. CDC. Considerations for the use of herpes zoster vaccines. cdc.gov/vaccines/acip/meetings/downloads/slides-2017-10/zoster-04-dooling.pdf. Published October 25, 2018. Accessed January 15, 2018. 10. Postherpetic neuralgia. Mayo Clinic website. mayoclinic.org/diseases-conditions/postherpetic-neuralgia/symptoms-causes/syc-20376588. Accessed January 16, 2018.